Consider an example of a real situation where you can use a multi-vari study for a Sigma Six project. It can be used to pare down a large collection of potential factors and discover the “critical few” factors that truly drive the performance of the process. A label supplier manufactures labels on rolls of adhesive backing strip. A critical characteristic of this process is the strength of adhesion of the labels to the backing strip. If it’s too strong, the labels have difficulty coming loose from the backing strip and cause problems in the label-applying machinery of the company’s customers. If it’s too weak, the labels fall off the products they’re placed on. It’s a problem with the adhesive application equipment, leading to inconsistent adhesion of the labels. It’s an operator issue driven by problems on the swing shift. It’s due to excessive variation in the adhesive itself. Ascertain the historical level of problem variation in the process. The historical level of variation in the adhesion performance of the process is 0.8 to 6.3 pounds. This example study will need to continue until about that range of variation is observed to make sure the culprit factor is captured within the study. How should a unit in this example study be defined? 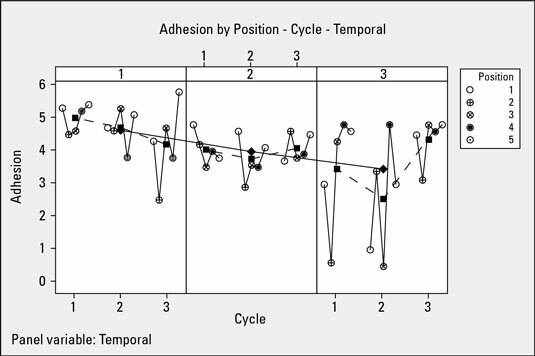 Adhesion force can’t be measured more than once on a single label, so setting the study unit as a single label isn’t viable. What about using a five-label section cut off a roll as the unit? That setup can be measured up to five times, so you define a unit to be a five-label strip off of a roll. Collect data from the process. You decide to start the multi-vari study by taking three consecutive five-label strips from each production shift and then testing all five labels on each of those strips. the 0.7- and 0.8-pound range; some also get as high as 6 pounds. Plotting the data in the positional, cyclical, and temporal groups, you can create a graphical multi-vari view of your data. Review the magnitudes of each of the categories of variation — positional, cyclical, and temporal. 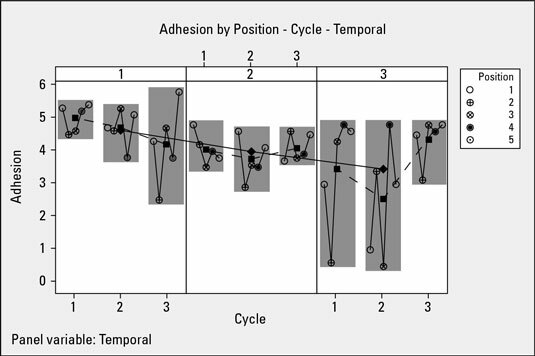 The largest magnitude of variation in the process output (adhesion) occurs within single units. Positional variation is the largest source of variation. Adhesion shows some deterioration as the day progresses. The grave shift readings have the most variation. The swing shift readings have the least variation. The positional variation and temporal variation may interact. Now you go back and review all the possible factors identified in the fishbone diagram or process flow map. You can cross any factor that was cyclical off the list of items for further investigation and flag positional factors and any related temporal factors.